For a system that doesn't have any moving parts, the exhaust system is very complicated. On the surface, it serves a seemingly basic function—move toxic engine fumes away from the cabin. However, the exhaust system also serves important roles in fuel economy, smog mitigation, and noise control. If you notice a dip in engine performance or fuel efficiency, there's a chance your exhaust system is to blame. 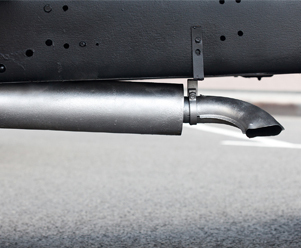 Just like all other parts of your car, the exhaust system needs occasional maintenance. Be sure to choose an experienced mechanic when you need car exhaust repair to ensure you maximize the value of your vehicle. Count on Cartech Automotive & Transmission Repair for exhaust repair service in San Antonio, TX. Our exhaust repair company is backed by more than 30 years of experience and our work is guaranteed, so you can expect quality workmanship and great customer service. We'll identify exactly what's wrong with your vehicle and fix it right the first time. The exhaust system is one of the most important parts of your car when it comes to fuel economy. Unused fuel, antifreeze, and various carbon deposits build up on the catalytic converter, the component responsible for filtering engine fumes. Eventually, the system will block up, and it won't be able to properly regulate fumes or filter unused fuel. Signs of failure include loud noises and black smoke spewing out the back of the vehicle. When this happens, you'll need to visit an exhaust repair shop to restore the performance of your vehicle. The problem will only get worse and it will cause your engine to burn out faster than it should. Rely on our pros for an accurate diagnosis and effective exhaust repair or replacement. We'll advise you of the wisest course of action and ensure that no other aspects are contributing to the drop in your car's performance. Expect quality workmanship at an honest price. Asian imports are reliable, but they still need maintenance to keep them running at peak efficiency. The bulk of our expertise pertains to Japanese imports and other Asian-manufactured cars. We're more familiar with the finer aspects of these cars, so you can trust us to find a solution quickly and efficiently. Contact us to schedule an appointment for exhaust service. We proudly serve San Antonio, Texas, and the surrounding area, including Helotes, Leon Valley, Pipe Creek, and Bandera.